Townhouses sometimes appreciate more slowly than detached houses. To many investors, townhouses represent attractive investment options because of their low cost of entry, numerous community amenities and nearly maintenance-free environment. Because land typically comes along with a townhouse purchase, many investors also expect high appreciation for these properties. But despite these benefits, a number of factors can make townhouses less than ideal as investment vehicles. Some potential downsides of investing in townhouses are a higher cost of entry, reduced potential for rentals, high HOA fees and a slower appreciation rate. It is importantly to clearly define what a townhouse is before you begin to consider the merits of investing in these properties. A townhouse is one of several properties that are conjoined within a larger unit. 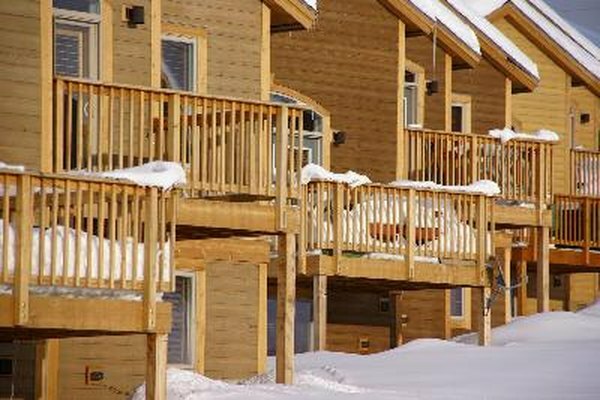 Unlike apartments, in which units are typically leased, each townhouse is owned by one or more people. Many investors find townhouses ideal investment properties because they carry lower initial price tags than comparable single-family homes. But even though savvy investors might pick up a townhouse for tens of thousands of dollars less than a detached home, budget-conscious buyers can typically find comparable condominium units for considerably lower prices than townhouses. For this reason, many investors looking for the highest possible yield prefer condos to townhouses. Depending on the local real estate market, investors might find townhouses somewhat more difficult to rent out than single-family homes. Even though many townhouses have yards, townhouse lawns are typically smaller that the lawns of free-standing houses. In addition, the shared nature of townhouse communities often makes yards less private. Some tenants take issue with the shared walls common in townhouse structures, and others might not meet strict homeowner association guidelines on outwardly visible aspects such as vehicles and window fixtures. In some cases, association rules concerning pets might prevent otherwise ideal tenants from renting a townhouse. Many townhouse homeowners’ associations, often known as HOAs, offer luxurious amenities such as swimming pools, community gyms, saunas, hot tubs, tennis courts, playgrounds, clubhouses and even libraries. In townhouse communities, HOAs typically also cover landscaping and maintenance on exterior components of the townhouses. These services come at a cost, though, and investors can find monthly homeowner association fees reaching into the hundreds of dollars. Townhouse homeowner associations also often ask owners, including investors, to help pay for major expenses such as repaving and security upgrades, through quarterly HOA fees in addition to monthly dues. In some cases, associations charge special assessments to cover large unexpected expenses such as legal fees or emergency repairs. Depending on the association’s financial management, the combination of monthly dues, quarterly dues and special assessments can exceed the amount of rent the investor receives for the property. Many investors purchase a property with the expectation of selling it for a higher price in the future. Investors in townhouses might find that these properties often appreciate at a somewhat slower rate than single-family homes, and that some townhouses even lose value. Because several factors contribute to a property’s appreciation, investors should carefully research historic real estate appreciation in the townhouse community and planned developments in the area before buying into a townhouse.